The table layout of a wedding reception can be challenging to plan, but a good layout encourages mingling, conversation, and celebration. 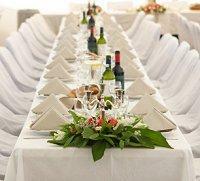 By planning the tables carefully, the bride and groom can ensure their wedding reception is a success. No matter how long the guest list, the tables at the reception must be planned carefully. The first step is to give the overall room an efficient layout, and then design individual tables for the best effect. 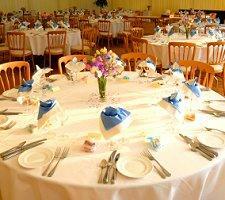 The types of tables used at a wedding reception depend on the number of guests and the shape of the available space. Round tables are accessible, but long rectangular tables can be a better use of space for a large group. Tables should also work well with the shape of the room – long tables are best in a narrow room while round tables are more versatile for uneven room shapes. Visibility: Keyspaces for reception events need to be clearly visible from all tables. The couple’s grand entrance, first dance, cake cutting, and wedding toasts are popular photo events, and guests will need good visibility to capture these romantic moments. Give each guest enough space. Personal Space: Cramming too many guests at a single table will be awkward and uncomfortable. The number of guests a table can seat depend on the table’s size and the type of meal: guests will need more space for a full, formal dinner than for light snacks. Gender: Many wedding reception layouts alternate male and female guests in individual seating assignments to encourage mingling. Couples: Guests who attend the wedding as a couple should always be seated together. This includes members of the bridal party who attend with their significant other who may not themselves be in the wedding party. Compatibility: Guests should be seated with individuals whom they will be comfortable with. Age, hobbies, interests, careers, and personal relationships should all be taken into account when creating a seating chart. Ease: A large reception may have a complicated layout, and there should be an easy way for guests to find their seats. Place cards are attractive, or a labeled table diagram could be available near the entrance. Decorations: The wedding table decorations should be chosen so they do not interfere with conversation or restrict personal space for each guest. Tiers are popular for the head table. Keep the table visible. Tiered or elevated designs are popular. Add extra decorations to distinguish the head table from other reception tables. Backdrops, special lighting, and elaborate centerpieces are easy ways to make this table stand out. Keep everyone at the head table facing the guests. Round tables are generally inappropriate for the head table. When planning the table layout of a wedding reception, couples often need to include specialty tables in addition to seating. While not all of these tables will be needed at every reception, knowing how to place them effectively will help keep the reception both beautiful and efficient. Cake Table: The cake is the centerpiece of the reception and should be placed in a visible location. At the same time, be sure there is enough space around the cake table for pictures without any danger of the cake getting damaged by a crowd. Gift Table: Guests may bring gifts to the reception, and a display table can showcase them elegantly. The table should be placed in a discreet location away from the entrance for better security. Most reception venues will have sample layouts available to assist couples with planning the table layout of a wedding reception. Sample table diagrams can also be found online at A Wedding Reception.Planning the tables for a wedding reception can be complicated, but good planning will help the reception flow more smoothly and be more enjoyable for everyone. Here is a helpful handout on room set up. As always ask questions when we do a walkthrough of your reception hall or venue.